On December 8, 2015, the Feast of the Immaculate Conception, the Church will commence the jubilee year of Mercy. The order of the liturgical seasons of the church guide us to great things and Advent, in particular, fills us with hope as we anticipate the renewal of Christ’s revolutionary way. 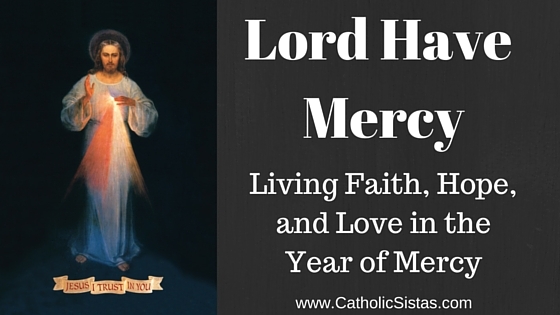 This year of Mercy approaches at a time when our world is tender with suffering, sin, and sadness. Families are enduring physical and mental illness, separation, and death. Communities are divided along racial, religious, and political lines. Global terrorist attacks are intensifying and suggest, as Pope Francis stated, that we are entering piecemeal into WWIII. The Jubilee of Mercy is the antidote that can restore hope, increase faith, and spread love. The Catholic Church teaches that God is Mercy. “You shall call his name Jesus, for he will save his people from their sins.” (Mt 1:21) His Mercy is described as infinite and unfathomable. Mercy is His goodness and justice given to repentant sinners. We receive the gift of His Mercy when we make a thorough and honest examination of our conscience, acknowledge our sins, and confess them with a contrite heart and a desire to refrain from returning to sin. (1 John 8-9) This requires courage and humility because if we dare to name our sin, we must surrender our attachment to it. For some, that means ending a relationship, quitting a job, or facing our addictions and our brokenness. Bishop Barron acknowledges that while the Church holds each of us to a high standard, that standard cannot be outdone by God’s infinite Mercy. At the World Meeting of Families, he said, “The Church’s extravagant demand … is coupled with an extravagant mercy. Don’t drive a wedge between the two … Moral demand all the way … Mercy all the way. 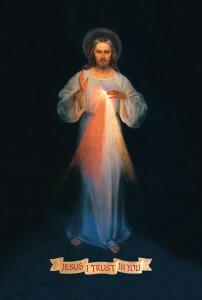 That is the prophetic speech of the Church.” Further, the catechism states that when we enter into this process honestly, we receive what Saint John Paul II referred to as a “double gift: the gift of the truth of conscience and the gift of the certainty of redemption.” That’s what God’s Mercy can do. And those most in need of Mercy are those most quenched by it. In this Jubilee year, we not only seek God’s Mercy to free us from the burden of our sins and the sins of others but we also have the opportunity to extend mercy to our neighbors. This is where we can contribute to the goal of restoring hope, increasing faith, and spreading God’s love. Sin casts a shadow on hope. When we sin, we choose to walk away from Christ; we are walking away from the light of hope. And, we are walking towards an understanding of life as random, meaningless, and ultimately pointless. This can affect our outlook and we can become jaded, judgmental, and discouraged. Our world needs us to be a beacon of hope. Turn to the Word for inspiration. The Word never fails. In this Jubilee, find a way to not only read, but also live the Word so that others see hope in you. Find a way to participate in the New Evangelization. The smallest ways can be the most powerful. Mother Teresa reminds us that peace begins with a smile. Do we lose faith because we sin or do we sin because we have lost our faith? In some ways, both scenarios are true. When we sin, we are not actively practicing our faith. And, therefore, faith diminishes. When we lose faith and turn to sin, it is because we misunderstand faith to be a feeling that makes us want to do good things. Faith is action, not feeling. During the Year of Mercy, participate in a pilgrimage to increase your faith. Pilgrimages provide each of us with what Pope Francis describes as a tangible experience of God’s mercy and the graces of the Jubilee year. Pray the rosary. When you pray the rosary, you pray the Gospel. If you pray all fifteen decades, you have reflected on the entire Gospel. Love is also misunderstood as a feeling. And, oh what trouble this has caused. For a primer on Love, read 1 Corinthians. Note that it says nothing about feelings. Rather, it does describe how we can actively love others. Let yourself be held to that high standard that Saint Paul preached to the Corinthians. Saint Catherine of Siena reminds us to “Reflect that God requires nothing else of us except that we show our neighbors the love we have for God.” Again, this takes courage and humility. Be willing to sacrifice your time, talents, and treasures as acts of love. Be willing to be laughed at, criticized, and humiliated for holding onto Christ in a world that is eager to be done with Him. Finally, what discussion about Mercy can be complete without a reminder of the works of mercy? Reacquaint yourself with them and make a plan to practice them during the coming year of Mercy. Ask yourself: How is God calling me to show mercy today? These works are not mere suggestions; rather, they are a Divine command. (Matthew 25:41) “Then he shall say to them also that shall be on his left hand: Depart from me, you cursed, in everlasting fire which was prepared for the devil and his angels. For I was hungry, and you gave me not to eat; I was thirsty, and you gave me not to drink. I was a stranger, and you took me not in; naked, and you covered me not; sick and in prison, and you did not visit me”, etc. Let us be buoyed by the hope filled message of Advent and spread the Good News through our works.